Exhibition devoted to the Por-Bazhyn fortress in Tuva in the south of Siberia, in close vicinity of the Russian-Mongolian border, on the island, situated on a high–mountain lake, will open in the State East Museum in Moscow on November 7 and will close on 25. This summer a large scale expedition excavated the remnants of the Por-Bazhyn Fortress that was built in the middle of the 8th century. Translated from the Tuvin language Por–Bazhin means an “earthenware house”. The expedition’s leader Professor Viktor Solovyov believes that it was a “summer residence' of the Uyghur Kagan. Most of its facilities were not inhabited rooms as they had a through passage. A facility in Tuva is a monument with complex architecture: there’s a labyrinth of buildings inside a regular rectangle. 'People's Dictation' was launched in Tuva on October 11, the day of the 63th anniversary of Tuva's joining Soviet Union. The mass action devoted to the Russian Language Year was initiated by school-teachers in the Sukpak village. 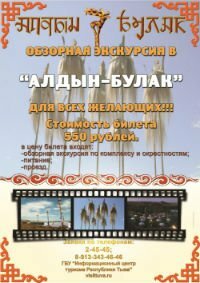 Tuvan teachers are troubled by the lowing level of the Russian language knowledge specially in the deep Tuvan provinces where there are no Russians. Monoliguistic surrounding does not urge young Tuvans to get to know Russian properly. Schools in Kyzyl are overcrowded with the influx of the schoolchilden from Tuvan villages. Their parents know that with scarce knowledge of the Russian language their children won't be able to enter higher educational institutions both inside Tuva and outside. If you're into throat singing, you are certainly going to enjoy Chirgilchin, a voice harmonizing quartet from Tuva, a small Russian province north of western Mongolia. It is a known fact that some of the best throat singers in the world hail from Tuva and a few of them are members of Chirgilchin. Take Igor Koshkendey. He has twice won the Tuvan International Throat Singing competition, winning in all of the six styles of throat singing.